Security is an issue for your company whenever there is data involved, especially if the information in question is available online. This applies to e-learning as much as data in any other form or in any other situation. Often, however, not enough attention is paid to data security when developing e-learning courses. This is changing as organisations in Dubai realise security challenges exist with e-learning so then take steps to address them. 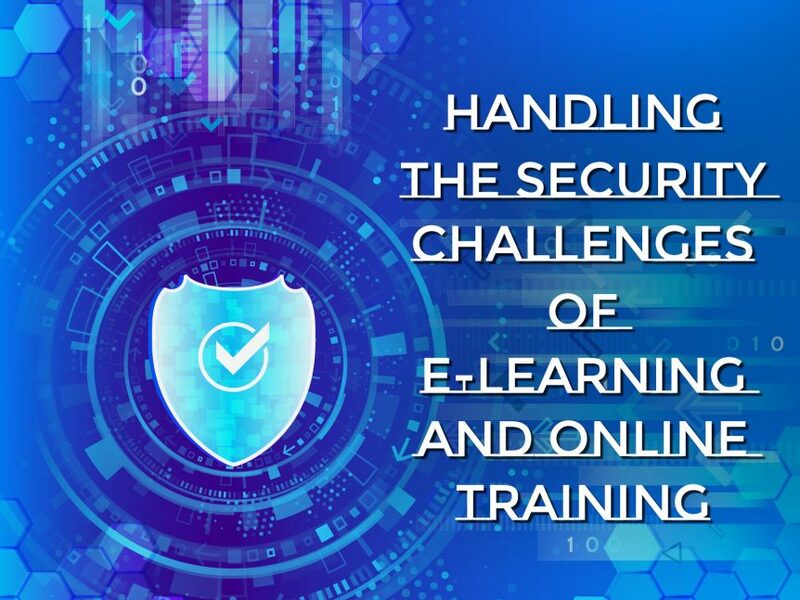 That last point is the most important – while e-learning and online training do present security challenges, none of those challenges are insurmountable. In fact, you can deal with them quickly, effectively, and easily when you are aware of the risks and then put a thorough plan in place. As one of the most experienced e-learning developers in the MENA region, here are our tips for ensuring the data included in your e-learning courses remains secure. The first step is to identify the data that should be protected, and the level of risk associated with that data. You should then assess carefully whether you can achieve the same result with the e-learning training by removing or amending the data. If you can’t, you will need to make sure it remains secure, but more on that in the points below. In the meantime, you should decide who can have access to the at-risk data, and who shouldn’t have access. You should then carefully consider using a professional e-learning developer. There are many benefits to using a professional developer, including security benefits. This is because high-quality developers who take security seriously will have tried-and-tested solutions that can be implemented in your training course to make it more secure. Whether you use a professional e-learning developer or not, you should make sure the LMS used for your e-learning courses comes from a reputable provider. There are lots of options out there, but the most popular, mainstream LMS solutions are typically the options that have the best in-built security features and options. By using a lower cost or lesser known LMS, you could be exposing your company to an increased security risk. It’s also important you keep the LMS up-to-date. This will ensure security patches identified by the LMS provider are applied to your system as soon as possible. If you have a managed LMS solution or you use a professional e-learning developer, this may be done for you automatically. You should check, however, and if it’s not, make sure you put a plan in place to update the LMS whenever necessary. You should also insist and/or ensure your e-learning courses are password protected. This usually means requiring users to sign in with a password before they can access the information and complete modules. You may also need to set up different levels of access for different users. After all, ensuring people only have access to the data they absolutely need is crucial to online security. You need to maintain this principle in your e-learning courses. This again comes back to passwords, i.e. preventing learners from accessing anything until they enter their username and password. Once they do this, the learner should only see data that you have explicitly given them access to. Finally, it’s important you have procedures in place to remove learners from the e-learning course when they should no longer have access. A good example is when an employee leaves your company. Many of the above points involve setting up access levels and protecting the information in your e-learning courses with passwords. This approach will only be effective, however, if learners use secure passwords. This isn’t always the case, however. In many situations, people choose passwords they can easily remember rather than passwords that are secure. This often means using a password they have used before. You should, therefore, put in place password protocols. If your LMS allows it, you should make these protocols compulsory. Even with the above password protocols in place, passwords – and the security of your e-learning course in general – can be put at risk because of the actions of learners. Examples include learners writing down their password or giving their password to another user. One way to overcome this is to give advice to learners on the importance of security and the steps they must take to keep your company’s data secure. Many e-learning courses are available online so learners can access them whenever they want, wherever they are, and on whatever device they choose. This offers massive benefits to your business, particularly in relation to engagement, completion, and retention rates, all of which go up. You must, however, protect your online courses with encryption technology. This is not complex or expensive, and a good e-learning developer will probably include it automatically. It’s important to remember, though, that encryption is essential even if you password-protect the e-learning course. Therefore, you should consider encryption as a basic standard of any e-learning course you make available online. Making your online training and e-learning courses more secure should be high on your priority list whenever you are planning your next course. You should even consider retrospectively applying the above standards and points where you identify risks and gaps in existing courses. As more elements of business become digitised, including training and learning, security must be central to all our thinking.